According to the latest research by Chinese scientists, the largest desert in China—Taklimakan Desert in Xinjiang—was formed at least 5.3 million years ago. 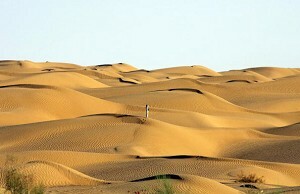 Taklimakan Dessert is also the second largest shifting-sand desert in the world, just after Sahara Desert in Africa. Its total area is 209,216 square miles, approximately the size of New Zealand. According to media reports from mainland China, researcher, Sun Jimin from the Institute of Geology and Geophysics, Chinese Academy of Sciences found an ancient Cenozoic Layer while doing fieldwork in Pishan County, near the Kunlun mountain range. The new finding provides direct evidence of the age of the Taklimakan Desert. According to Sun, the Cenozoic Layer is located in the southwest part of the Taklimakan Desert. It has a large amount of yellow soil carried there by wind. Using the paleomagnetism dating method, he concluded that the oldest yellow soil in the Cenozoic Layer has a history of at least 5.3 million years. This finding makes the age of the Taklimakan Desert 1.8 million years older than the previous 3.5 million years estimated by Chinese scientists several years ago. Sun said that the location of different samples contributes to the difference in age dating. In 2002, Zhen Hongbo and his colleagues from Tongji University found the Aeolian Sediment Layer in Yecheng County, about 50 miles from Pishan County. From this finding, they drew the conclusion that the Taklimakan Desert had a history of at least 3.5 million years.